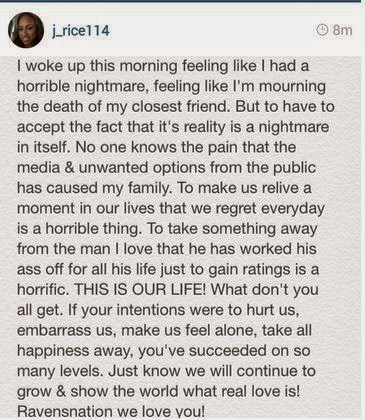 I drafted this blog post before reading Janay Rice’s statement, intending it as a show of solidarity and a “Shut your stupid mouth” to those who wonder why she married Ray after the elevator incident. Having read her statement, I feel she’d prefer silence to solidarity. But silence on domestic violence solves nothing, so I am sharing my story anyway. This small truth is a kiss on the cheek compared to that video, but sharing it now feels like a right thing to do. One sunny afternoon in middle school, I was walking home when Gio [not his name] emerged from the alley between my apartment complex and the adjacent row houses. Though we hung out with the same people in the summer, his presence that day seemed odd. He told me about some baseball cards he wanted to give my brother. He barely knew David, and baseball cards weren't popular. But the gesture was surprisingly thoughtful, so I followed Gio through the alley to his house for the cards. I stopped on the steps outside his apartment because I'd never been there before and didn't want to go in. But he said his mother didn't want him leaving the door open, so I had to come inside. There were stairs leading up and down, but I stayed where I was. He said I had to follow him upstairs because his mother didn't want people downstairs in her living room and I couldn't stay on the landing. "Is your mother home?" I asked. He didn't turn around. "No." I didn't like it, but I went upstairs. When I arrived upstairs, the door to his bedroom was wide open. The place was a mess, papers and clothes everywhere. As he tore up the room looking for the cards, a charcoal-colored cat walked toward me. Though he was friendly, I scrunched up my nose. He stopped rummaging through the junk, picked up the cat, and hurled it across the room. At my horrified look, he shrugged. I headed downstairs. "I need to go home." "Wait!" He jumped over the piles and entered the hall. "You can't leave." "You don't have the cards yet. And David will be disappointed." David hadn't asked for the cards and didn't know they were coming. But I returned upstairs anyway, where he magically produced a tattered plastic bag. I took the bag with muted thanks and headed downstairs again, pausing only at the front door. Tossing a "See you later" over my shoulder, I turned the doorknob and pulled it toward me. A flat hand came from behind and slammed the door shut. I turned around in shock and found him hovering over me, the slight height difference seeming much greater. "Come on. Just let me do it to you." I shook my head, trying not to panic. "I need to get home to David." He smiled again and removed his hand from the door. With genuine relief, I stepped back while he opened the door. But as I moved toward it, Gio pulled me back by the wrist and closed the door again, locking it with an audible click. He pushed me against the door, pinning me there with his body. "Just let me do it to you real quick. I won't tell nobody." I continued to shake my head, asking to go home. His hand went under my skirt at the knee, and I closed my eyes. Tears threatened as he leaned fully against me, his other hand holding my waist. "Please let me do it to you." He didn't say anything, and I braced for the worst. All of a sudden, he pulled back and released me. "Go 'head. I'm just messing with you." He reached around me and unlocked the door, grinning as I stepped outside. I turned around, baffled and afraid, and with an indifferent "See you," he shut his front door. But my story doesn't end there. Later that afternoon, Gio came around to hang out as usual. He smiled and joked with everyone like nothing had happened, made no mention of my brother or the baseball cards. He treated me no differently, and from what I could tell, he hadn't said anything to his friends about what happened at his house. I did and said nothing. I didn’t ask him why he did it, didn’t wonder aloud what kind of person would knowingly frighten a female friend one minute then come around to chill the next. I didn’t run in the house and tell my Daddy what Gio did, didn't mention it to my friends until years later. I wasn't raped or beaten, cursed or berated. Gio barely touched me and then only briefly. I hadn’t suffered years of violence and intimidation at his hands, worried what he would do if I told the truth. I didn’t wonder if anyone would believe me or if those who believed would care. I was a rational being who knew I’d been wronged, yet I did nothing to hold Gio accountable for it. For every woman I've ever been, I was once a scared little girl who never said anything. And when I think of Janay Rice and others like her, I hope she someday finds the courage to give a voice to the one inside her who isn't saying anything. I imagine she has quite a story to tell.